Vaginal dryness improved in over 90% of the patients. Dyspareunia improved in 100% of the patients. 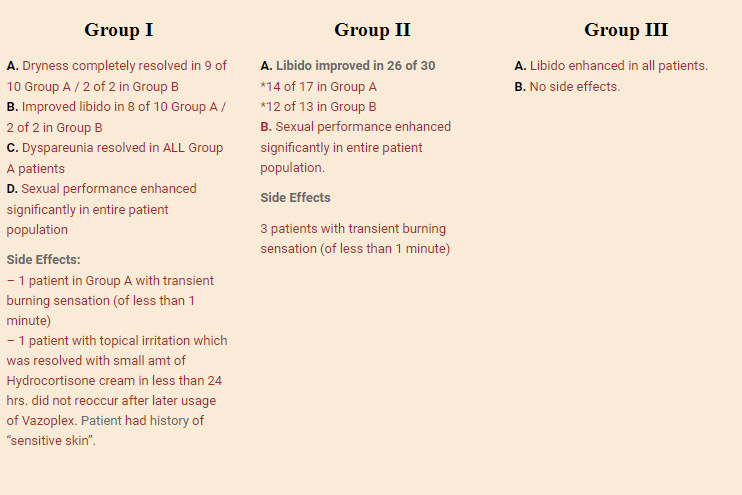 Libido improved in almost 90% of the patients. Sexual performance was enhanced in 100% of the patient population. Side effects were minimal occurring in <10% of the patients and were considered mild and transient. Only one patient experienced topical irritation that responded to Hydrocortisone cream in less than 24 hours. The irritation did not reoccur with further usage. My impression is that the patient misapplied the Vazoplex to epidermal tissue not in the vaginal introitus but more in the symphysis pubis area. I do not consider this a significant issue and questioned other patients none of whom had any topical irritation. Vazoplex is an effective product for vaginal dryness, dyspareunia, enhancing sexual performance and improving libido (even in patients that did not realize they had a diminished libido).